Luke is the Master now! And when it comes to Rey, he's going to ride her pretty hard. 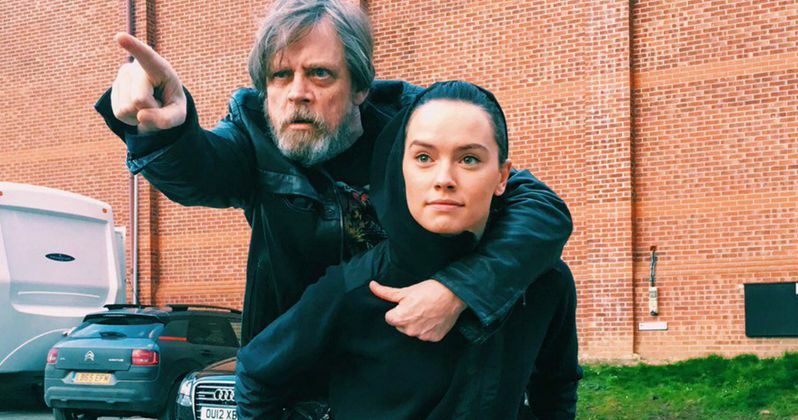 While it hasn't been revealed that Rey is Luke's Padawan learner in Star Wars: Episode VIII, actor Mark Hamill is teasing the intense character relationship between these two in a new photo from outside the Star Wars: Episode VIII set. And it's obvious the pair are having quite a lot of fun. A few days ago, Mark Hamill promised he'd be sharing a special Jedi treat in honor of co-star Daisy Ridley's birthday. Unlike his cute joke on April Fools' Day, he came through like a champ with a photo that is sure to put a smile on your face. And it's amazing the way he's able to visually transform himself into Yoda's doppleganger without any make-up or CGI effects. You can see the image below, which Mark Hamill shared on his Twitter page. He says the following. "A long time ago (last week I think) In a galaxy far, far way(@PinewoodStudios ) THIS happened! Happy Birthday Daisy!" Rey took her first steps into a larger world in Star Wars: The Force Awakens. Now she will continue her epic journey with Finn, Poe, and Luke Skywalker in the next chapter of the continuing Star Wars saga, Star Wars: Episode VIII. Disney and Lucasfilm have confirmed that principal photography began at Pinewood Studios in London on February 15, 2016. Star Wars: Episode VIII is written and directed by Rian Johnson. This highly anticipated sequel continues the storylines introduced in Star Wars: The Force Awakens Coming back are cast members Mark Hamill, Carrie Fisher, Adam Driver, Daisy Ridley, John Boyega, Oscar Isaac, Lupita Nyong'o, Domhnall Gleeson, Anthony Daniels, Gwendoline Christie, and Andy Serkis. New cast members will include Academy Award winner Benicio Del Toro, Academy Award nominee Laura Dern, and talented newcomer Kelly Marie Tran. Star Wars: Episode VIII is produced by Kathleen Kennedy and Ram Bergman and executive produced by J.J. Abrams, Jason McGatlin, and Tom Karnowski. Joining the production crew will be some of the industry's top talent, including Steve Yedlin (Director of Photography), Bob Ducsay (Editor), Rick Heinrichs (Production Designer), Peter Swords King (Hair and Make-Up Designer), and Mary Vernieu (US Casting Director). They will be joining returning crew members Pippa Anderson (Co-Producer, VP Post Production), Neal Scanlan (Creature & Droid FX Creative Supervisor), Michael Kaplan (Costume Designer), Jamie Wilkinson (Prop Master), Chris Corbould (SFX Supervisor), Rob Inch (Stunt Coordinator), Ben Morris (VFX Supervisor), and Nina Gold (UK Casting Director). No story details have been released at this time. And none of the new characters have been announced. Star Wars: Episode VIII is scheduled for release December 15, 2017. Take a look as Rey and Luke reenact a key scene from The Empire Strikes back!